This is a list of countries located on more than one continent, known as transcontinental states or intercontinental states. While there are many countries with non-contiguous overseas territories fitting this definition, only a limited number of countries have territory straddling an overland continental boundary, most commonly the line that separates Europe and Asia. The boundary between Europe and Asia is purely conventional, and several conventions remained in use well into the 20th century. However, the now-prevalent convention, used for the purposes of this list, follows the Caucasus northern chain, the Ural River and the Ural Mountains. It has been in use by some cartographers since about 1850. This convention results in several countries finding themselves almost entirely in "Asia", with a few small enclaves or districts technically in "Europe". Notwithstanding these anomalies, this list of transcontinental or intercontinental states respects the convention that Europe and Asia are full continents rather than subcontinents or component landmasses of the larger Eurasian continent. Listed further below, separately, are countries with distant non-contiguous parts (overseas territories) on separate continents. A map of transcontinental countries, and countries that control territory in more than one continent. 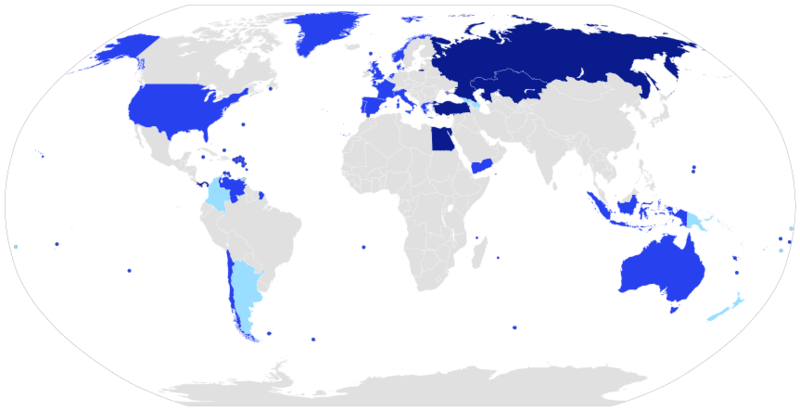 Countries whose transcontinental status depends on either the legal status of their claims or the definition of continental boundaries used. Transcontinental states are sovereign states that are divided between one geographical continent and another. In this article, states are divided between Contiguous and Non-contiguous transcontinental states. Contiguous transcontinental states are states that contain a portion of their territory on one continent and a portion of their territory on another continent, while having these two portions connected via a natural geological land connection (e.g. Russia) or the two portions being immediately adjacent to one another (e.g. Turkey). Non-contiguous transcontinental states are states that contain a portion of their territory on one continent and a portion of their territory on another continent, while having these two portions separated by a significant enough distance, or body of water, to not be considered adjacent. For the purposes of the lists within this article, a seven-continent model model is assumed. Micronations, dependent territories, autonomous regions, and sub-national entities of sovereign states, if they are in themselves transcontinental, are to be excluded from the lists in this article as a separate entry from a controlling state. States that have territory across sub-continental boundaries, and plate boundaries internal to continents, are excluded from these lists as these do not constitute being transcontinental in the seven-continent model. States with limited recognition are excluded from the lists in this article, and any entry must be a UN member state or a part of the UN system. The modern convention for the land boundary between Asia and Africa runs along the Isthmus of Suez and the Suez Canal in Egypt. The border continues through the Gulf of Suez, Red Sea and Gulf of Aden. In antiquity, Egypt had been considered part of Asia, with the Catabathmus Magnus escarpment taken as the boundary with Africa (Libya). Two of 27 governorates of Egypt lie entirely on the Asian Sinai Peninsula and two are transcontinental: Ismailia Governorate is nearly equally divided by the Suez Canal, and Suez Governorate, which is coterminous with the "transcontinental city" of Suez, has a small portion east of the Canal. After the Yom Kippur War of October 1973, Israel briefly became a transcontinental country as it occupied territory on the African side of the Suez Canal, in addition to the entirety of Sinai. The land was returned in 1975 per the Sinai Interim Agreement. Conventions used for the boundary between Europe and Asia during the 18th and 19th centuries. The red line shows the modern convention, in use since c. 1850. The conventional Europe-Asia boundary was subject to considerable variation during the 18th and 19th centuries, indicated anywhere between the Don River and the Caucasus to the south or the Ural Mountains to the east. Since the later 19th century, the Caucasus–Urals boundary has become almost universally accepted. According to this now-standard convention, the boundary follows the Aegean Sea, the Turkish Straits, the Black Sea, along the watershed of the Greater Caucasus, the northwestern portion of the Caspian Sea and along the Ural River and Ural Mountains to the Arctic Ocean. According to this convention, the Russian Federation, the Republic of Turkey, Kazakhstan, Azerbaijan and Georgia have territory both in Europe and in Asia. The Russian Federation includes substantial territory in Northern Asia, historically incorporated into the Tsardom of Russia in the 17th century. European Russia has a population of about 110 million, or some 75% of the country's total population, though more than 75% of Russia's territory is in Asia. The territory of the Republic of Turkey is predominantly in Asia, with European Turkey (East Thrace) accounting for about 11 million people, or some 14% of the country's population. The territory of Turkey is a remnant of that of the Ottoman Empire, which had replaced the transcontinental Byzantine Empire with the Fall of Constantinople in 1453. The Turkish city Istanbul (ancient Constantinople) lies on both sides of the Bosporus, making it a "transcontinental city". Çanakkale is also a Turkish city situated on two continents. Kazakhstan's physical, cultural, and geographic characteristics are Central Asian, but its West Kazakhstan and Atyrau provinces extend on either side of the Ural River, placing a population of less than one million (out of 15 million) geographically in Europe. Azerbaijan's Qusar, Shabran, Siazan, Khachmaz and Quba districts are north of the Greater Caucasus watershed and thus geographically in Europe, placing a population of about half a million (or ca. 5% of the country's total population) in Europe. Georgia is in Transcaucasia, and thus geographically in Asia, except for a small area in the upper reaches of the Terek River, corresponding to Kazbegi Municipality (population 3,800 as of 2014, ca. 0.1% of the country's population). Greece: The territory of Greece includes a number of islands just off the coast of Asia Minor, such as Rhodes, Kos, Samos, Chios, Lesbos and Kastellorizo. Greenland: Greenland is a country within the Kingdom of Denmark, fully located on the North American tectonic plate and close to the mainland, and is considered to be geographically part of North America. Although it is politically associated with Europe and internationally represented by a European country (including in the Council of Europe), it is autonomous. Historically and ethnically, its native population is of American tradition, although it also shares cultural links with other native peoples bordering the Arctic Sea in Northern Europe and Asia (today in Norway, Sweden, Finland and Russia), as well as in North America (Alaska in the U.S., Northwest Territories and Nunavut in Canada). Greenland was part of Danish territory and within the territory of the European Union, but voted for more autonomy and is now excluded from Union. Portugal: Continental Portugal is in Europe, while the Azores archipelago (also associated with Europe) has two islands (Corvo and Flores) that are part of the North American plate. This might make Portugal a "tricontinental country" geologically (with Madeira on the African plate) except that continents, as already noted, are not defined by tectonic plates. The Netherlands: Though most of the Kingdom of the Netherlands' land-mass is in Europe, it also includes six island territories in the Lesser Antilles archipelago of the Caribbean Sea: the Dutch Caribbean. Since the dissolution of the Dutch Antilles in 2010, the sovereign Kingdom of the Netherlands has been administratively divided into four non-sovereign constituent "countries": Aruba, Curaçao, Sint Maarten and The Netherlands — the last of which includes the islands of Bonaire, St. Eustatius and Saba (collectively known as the BES islands or the Caribbean Netherlands) in the Caribbean area as "special municipalities", making it a non-sovereign transcontinental country within the kingdom. France: Metropolitan France is in Europe, while the five Overseas Departments and six Overseas Collectivities are in other continents. Guadeloupe, Martinique, Saint-Martin, Saint-Barthélemy, and Saint-Pierre and Miquelon are in North America, French Guiana is in South America, Mayotte and Réunion are in Africa, and New Caledonia, French Polynesia, and Wallis and Futuna are in Oceania. These Overseas Departments and Collectivities are integral parts of France, as are the uninhabited Clipperton Island in North America and French Southern and Antarctic Lands which include Scattered Islands in Africa, St. Paul and Amsterdam islands on the Australian Plate, and Kerguelen Islands, Crozet Island and Adélie Land in Antarctic. French sovereignty on Adélie Land is under Antarctic Treaty System . Italy: Italy has a number of small islands south of Sicily which, geographically can be considered part of the African continent, due to their proximity to Tunisia. The closest land to Pantelleria and the Pelagie Islands (Lampedusa, Linosa and Lampione) is Tunisia on the African mainland. Nevertheless, Pantelleria and Linosa are considered part of Europe, Lampedusa and Lampione part of Africa. Portugal: Continental Portugal is in Europe, while the archipelago of Madeira, an autonomous region of Portugal (including Porto Santo Island, the Desertas Islands and the Savage Islands), is associated with Africa. If we consider that the Azores autonomous region of Portugal has two islands (Flores and Corvo) that are part of North American tectonic plate (see Europe and North America section above), Portugal would be a transcontinental country geologically except for the fact these plates are not defined as continents. Spain: Although its mainland is in Europe, Spain has territory including two provinces and two autonomous cities in Africa. Close to 5% of Spain's population live on the African continent. Territories include the Canary Islands in the Atlantic, the cities of Ceuta and Melilla on mainland North Africa and its Plazas de soberanía close to those cities) that are geographically part of Africa. The Canary Islands, Ceuta and Melilla are three of the 19 autonomous communities and cities that form Spain, while the Plazas de Soberanía are under different military status. The African Mediterranean island of Isla de Alborán belongs to the transcontinental city of Almería and the transcontinental province of Almería. Yemen: Although mainland Yemen is in the southern Arabian Peninsula and thus part of Asia, and its Hanish Islands and Perim in the Red Sea are associated with Asia, Yemen's national territory extends to the archipelago of Socotra, which lies east of the horn of Somalia and is much closer to Africa than to Asia. Australia: The Commonwealth of Australia consists of its namesake continent and island possessions associated with Oceania, Asia, and Antarctica. Its Indian Ocean island possessions of Christmas Island and the Cocos (Keeling) Islands are associated with Asia. The majority of Australia's Asian island residents have Asian ancestry and are Muslim or Buddhist. The Indonesian Archipelago which lies on the border of Melanesia and Southeast Asia. Depending on the interpretation of the border, the Philippines, Malaysia and Indonesia, and Papua New Guinea can be considered transcontinental countries and East Timor, Brunei and Singapore can be on either side. Papua New Guinea anthropologically is a part of Melanesia and is sometimes included in the Indonesian Archipelago. It is an observer in ASEAN and has contemplated full membership. Japan's Izu islands, Ogasawara islands, and Minami Torishima are occasionally considered Oceanian. United States: While the territory of the United States lies overwhelmingly in North America, it includes the state of Hawaii in Oceania as well as other Oceanian island possessions and Alaskan islands on NE Asia's continental shelf. Ecuador: Ecuador contains the Galapagos islands, which, depending on the definition, either lie in South America or Oceania as part of the Polynesian region. Aruba, Bonaire, Curaçao and Trinidad and Tobago: The sea islands division of South America and North America is complicated. All Caribbean islands are often labeled as North American, but the Kingdom of the Netherlands countries of Aruba and Curaçao, and the Dutch special municipality of Bonaire lie on the continental shelf of South America, and can be considered South American as well. What complicates it even further is that the islands of Trinidad and Tobago lie on two continental shelves. The southern half of Trinidad lies in South America and the northern half of Trinidad, and Tobago, lie on the Caribbean plate. All these islands have closer cultural ties with North America. Colombia: Mainland Colombia is in northwestern South America and Malpelo Island in the Pacific Ocean is also associated with South America, but the nation also controls the San Andrés and Providencia archipelago, 640 kilometres (400 mi) WNW of Colombia's Caribbean coast, near the Caribbean coast of Nicaragua. This archipelago is coterminous with the department of the same name. Venezuela: Mainland Venezuela is in South America, but Isla Aves is geographically North American. Isla Aves is one of the federal dependencies of Venezuela under the administration of the Ministry of Popular Power for Interior, Justice and Peace. Chile is mostly on the South American mainland and includes the Oceanian islands of Easter Island and Sala y Gómez Island. They and the outlying South American Juan Fernández Islands and Desventuradas Islands are part of the Valparaíso Region. The Danish Realm includes Denmark as well as the North American island of Greenland and the Faroe Islands associated with Europe. Greenland was integrated into the Danish Realm in 1953 and home rule was granted in 1979. The Kingdom of the Netherlands includes the constituent countries of Aruba, Curaçao, and Sint Maarten. In addition, after the split of the Netherlands Antilles the Caribbean islands of Bonaire, Sint Eustatius and Saba became special municipalities incorporated into the metropolitan Netherlands. A number of nations claim ownership over portions of the continent of Antarctica. Some, including Argentina and Chile, consider the Antarctic land they claim to be integral parts of their national territory. Some nations also have sub-Antarctic island possessions north of 60°S latitude and thus recognized by international law under the Antarctic Treaty System, which holds in abeyance land claims south of 60°S latitude. ^ "transcontinental". OxfordDictionaries.com. Retrieved 5 February 2019. ^ "contiguous". Dictionary.Cambridge.org. Retrieved 5 February 2019. ^ a b Misachi, John (25 April 2017). "Which Countries Span More Than One Continent?". WorldAtlas.com. Retrieved 5 February 2019. ^ a b Ramos, Juan (19 March 2018). "What Continent Is Egypt Officially In?". ScienceTrends.com. Retrieved 5 February 2019. ^ "Continent". NationalGeographic.org. National Geographic. Retrieved 5 February 2019. ^ National Geographic Atlas of the World (9th ed.). Washington, DC: National Geographic. 2011. ISBN 978-1-4262-0634-4. "Europe" (plate 59); "Asia" (plate 74): "A commonly accepted division between Asia and Europe ... is formed by the Ural Mountains, Ural River, Caspian Sea, Caucasus Mountains, and the Black Sea with its outlets, the Bosporus and Dardanelles." ^ World Factbook. Washington, DC: Central Intelligence Agency. ^ "Socotra". Britannica.com. 6 May 2014. Retrieved 5 February 2019. ^ Evans, Mike. "Islands east of the Horn of Africa and south of Yemen". WorldWildlife.org. Retrieved 5 February 2019. ^ "Papua New Guinea asks RP support for Asean membership bid". GMA News. Retrieved 15 July 2014. The boundaries between the continents of Earth are generally a matter of geographical convention. Several slightly different conventions are in use. The number of continents is most commonly considered seven but may range as low as four when the Americas and Afro-Eurasia are each considered a single continent. According to the definition of a continent in the strict sense, an island cannot be part of any continent, but by convention and in practice most major islands are associated with a continent. in Islam which developed into multi-ethnic trans-national empires. During the medieval period, three major caliphates succeeded each other: the Rashidun Caliphate (632–661), the Umayyad Caliphate (661–750) and the Abbasid Caliphate (750–1258). In the fourth major caliphate, the Ottoman Caliphate, the rulers of the Ottoman Empire claimed caliphal authority from 1517. During the history of Islam, a few other Muslim states, almost all hereditary monarchies, have claimed to be caliphates.Prior to the rise of Muhammad and the unification of the tribes of Arabia under Islam, Arabs followed a pre-Islamic Arab polytheism, lived as self-governing sedentary and nomadic communities, and often raided their neighbouring tribes. Following the early Muslim conquests of the Arabian Peninsula, the region became unified and most of the tribes adopted Islam.The first caliphate, the Rashidun Caliphate, was established immediately after Muhammad's death in 632. The four Rashidun caliphs, who directly succeeded Muhammad as leaders of the Muslim community, were chosen through shura, a process of community consultation that some consider to be an early form of Islamic democracy. The fourth caliph, Ali, who, unlike the prior three, was from the same clan as Muhammad (Banu Hashim), is considered by Shia Muslims to be the first rightful caliph and Imam after Muhammad. Ali reigned during the First Fitna (656–661), a civil war between supporters of Ali and supporters of the assassinated previous caliph, Uthman, from Banu Umayya, as well as rebels in Egypt; the war led to the establishment of the Umayyad Caliphate under Muawiyah I in 661. The third caliphate, the Abbasid Caliphate was ruled by the Abbasids, a dynasty of Meccan origin which descended from Hashim, a great-grandfather of Muhammad, making them part of Banu Hashim, via Abbas, an uncle of Muhammad, hence the name. Caliph al-Mansur founded its second capital of Baghdad in 762 which became a major scientific, cultural and art centre, as did the territory as a whole during a period known as the Islamic Golden Age. From the 10th century, Abbasid rule became confined to an area around Baghdad. From 945 to 1157, the Abbasid Caliphate came under Buyid and then Seljuq military control. In 1250, a non-Arab army created by the Abbasids called the Mamluks came to power in Egypt. In 1258, the Mongol Empire sacked Baghdad, ending the Abbasid Caliphate, and in 1261 the Mamluks in Egypt re-established the Abbasid Caliphate in Cairo. Though lacking in political power, the Abbasid dynasty continued to claim authority in religious matters until the Ottoman conquest of Mamluk Egypt in 1517.The fourth major caliphate, the Ottoman Caliphate, was established after their conquest of Mamluk Egypt in 1517. The conquest gave the Ottomans control over the holy cities of Mecca and Medina, previously controlled by the Mamluks. The Ottomans gradually came to be viewed as the de facto leaders and representatives of the Muslim world.In the Indian subcontinent, dominant powers such as the Delhi Sultanate's Alauddin Khilji, Mughal Empire's sixth ruler Aurangzeb, and Mysore's kings Hyder Ali and Tipu Sultan have been generally heralded as few of the Indian caliphs ever existed, due to their establishments of Islamic laws throughout South Asia. Following their defeat in World War I, their empire was partitioned by the United Kingdom and French Third Republic, and on 3 March 1924, the first President of the Turkish Republic, Mustafa Kemal Atatürk, as part of his reforms, constitutionally abolished the institution of the caliphate. A few other states that existed through history have called themselves caliphates, including the Isma'ili Fatimid Caliphate in Northeast Africa (909–1171), the Umayyad Caliphate of Córdoba in Iberia (929–1031), the Berber Almohad Caliphate in Morocco (1121–1269) and the Fula Sokoto Caliphate in present-day northern Nigeria (1804–1903). The Sunni branch of Islam stipulates that, as a head of state, a caliph may come to power in one of four ways: either through an election, through nomination, through a selection by a committee, or by force. A number of followers of Shia Islam, however, believe a caliph should be an Imam chosen by God from the Ahl al-Bayt (the "People of the House", referring to Muhammad's family).In the early 21st century, following the failure of the Arab Spring and defeat of the self-proclaimed "Islamic State", there has seen "a broad mainstream embrace of a collective Muslim identity" by young Muslims and the appeal of a caliphate as a "idealized future Muslim state" has grown ever stronger. This is a list of countries which border two or more oceans, including both sovereign states and dependencies, provided the same contiguous territory borders on more than one of the five named oceans, the Pacific, Atlantic, Indian, Southern, and Arctic. Countries which border on multiple oceans because of discontiguous regions are excluded here but included in the list of transcontinental countries. Spain (Spanish: España [esˈpaɲa] (listen)), officially the Kingdom of Spain (Spanish: Reino de España), is a country mostly located in Europe. Its continental European territory is situated on the Iberian Peninsula. Its territory also includes two archipelagoes: the Canary Islands off the coast of Africa, and the Balearic Islands in the Mediterranean Sea. The African enclaves of Ceuta, Melilla, and Peñón de Vélez de la Gomera make Spain the only European country to have a physical border with an African country (Morocco). Several small islands in the Alboran Sea are also part of Spanish territory. The country's mainland is bordered to the south and east by the Mediterranean Sea except for a small land boundary with Gibraltar; to the north and northeast by France, Andorra, and the Bay of Biscay; and to the west and northwest by Portugal and the Atlantic Ocean. With an area of 505,990 km2 (195,360 sq mi), Spain is the largest country in Southern Europe, the second largest country in Western Europe and the European Union, and the fourth largest country in the European continent. By population, Spain is the sixth largest in Europe and the fifth in the European Union. Spain's capital and largest city is Madrid; other major urban areas include Barcelona, Valencia, Seville, Málaga and Bilbao. Modern humans first arrived in the Iberian Peninsula around 35,000 years ago. Iberian cultures along with ancient Phoenician, Greek, Celtic and Carthaginian settlements developed on the peninsula until it came under Roman rule around 200 BCE, after which the region was named Hispania, based on the earlier Phoenician name Sp(a)n or Spania. At the end of the Western Roman Empire the Germanic tribal confederations migrated from Central Europe, invaded the Iberian peninsula and established relatively independent realms in its western provinces, including the Suebi, Alans and Vandals. Eventually, the Visigoths would forcibly integrate all remaining independent territories in the peninsula, including Byzantine provinces, into the Kingdom of Toledo, which more or less unified politically, ecclesiastically and legally all the former Roman provinces or successor kingdoms of what was then documented as Hispania. In the early eighth century the Visigothic Kingdom fell to the Moors of the Umayyad Islamic Caliphate, who arrived to rule most of the peninsula in the year 726, leaving only a handful of small Christian realms in the north and lasting up to seven centuries in the Kingdom of Granada. This led to many wars during a long reconquering period across the Iberian Peninsula, which led to the creation of Kingdom of Leon, Kingdom of Castille, Kingdom of Aragon and Kingdom of Navarre as the main Christian kingdoms to face the invasion. Following the Moorish conquest, Europeans began a gradual process of retaking the region known as the Reconquista, which by the late 15th century culminated in the emergence of Spain as a unified country under the Catholic Monarchs. In the early modern period, Spain became the world's first global empire and the most powerful country in the world, leaving a large cultural and linguistic legacy that includes +570 million Hispanophones, making Spanish the world's second-most spoken native language, after Mandarin Chinese. During the Golden Age there were also many advancements in the arts, with world-famous painters such as Diego Velázquez. The most famous Spanish literary work, Don Quixote, was also published during the Golden Age. Spain hosts the world's third-largest number of UNESCO World Heritage Sites. Spain is a secular parliamentary democracy and a parliamentary monarchy, with King Felipe VI as head of state. It is a major developed country and a high income country, with the world's fourteenth largest economy by nominal GDP and sixteenth largest by purchasing power parity. It is a member of the United Nations (UN), the European Union (EU), the Eurozone, the Council of Europe (CoE), the Organization of Ibero-American States (OEI), the Union for the Mediterranean, the North Atlantic Treaty Organization (NATO), the Organisation for Economic Co-operation and Development (OECD), Organization for Security and Co-operation in Europe (OSCE), the Schengen Area, the World Trade Organization (WTO) and many other international organisations. While not an official member, Spain has a "Permanent Invitation" to the G20 summits, participating in every summit, which makes Spain a de facto member of the group.